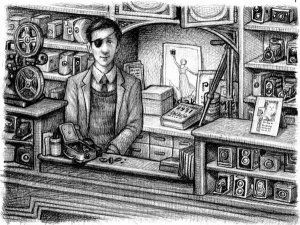 Martin Scorsese is in talks to direct the adaptation of Brian Selznick’s children’s book The Invention of Hugo Cabret. The project would not only reunite him with The Departed producer Graham King, but also with The Aviator writer John Logan, according to Variety (although a couple of European publications first reported this story; they naturally received no credit from Variety). With production targeted for May, this would be a fast-tracked movie for GK Films and Scorsese. Story centers on Hugo, a young orphan living in a Paris train station during the 1930s, who must solve the mystery of a discarded automata (wind-up robot) left by his dead father. Selznick based the story on Georges Méliès, a real-life magician-turned-filmmaker in the early 1900s who collected automata that was donated to a museum and later thrown away. For why the book is so unique and impressions, hit the jump. Originally released in 2007, The Invention of Hugo Cabret is noted for consisting of nearly 300 pages of pictures inside the 500-plus page book that mixes the two for a unique effect. Selznick even describes the books as “not exactly a novel, not quite a picture book, not really a graphic novel, or a flip book or a movie, but a combination of all these things.” The book is actually interspersed with pictures that replace the text to tell the story. Meanwhile, Scorsese seems to be following the current trend of well-known directors adapting children’s books within the past year. With Spike Jonze’s Where the Wild Things Are and Wes Anderson’s The Fantastic Mr. Fox, the track record is fairly impressive so far. However, both of the books they were adapted from pale in comparison to the sheer length and size of The Invention of Hugo Cabret. With Logan’s screenplay and King producing, this certainly seems like we have another potential hit adapted from an interesting children’s story. CONAN Is Jason Momoa; Mickey Rourke as Corin (aka Papa Barbarian)?